For those of you out there in internet land who have a utility trailer that is used to carry your ATVs and dirt bikes out to the sand dunes, sometimes finding a ramp that is portable and strong enough isn't always an easy task. There are plenty of inexpensive ramps out there that seem like they could work but end up bending or buckling under the weight of your bike. If you've experienced this problem before, it might be a good time to consider this ramp made by Discount Ramps. The 60-inch Tri-Folding Loading Ramp makes the not-so-fun task of loading up your toys to get where the fun is going to be had a little bit easier. It has a weight capacity of 1500 pounds, so you're more than able to load up your motorcycle and ATV with it, as well as use it to load up a riding lawnmower or other wheeled equipment, too. The rungs are serrated to provide the most traction available, and the lip that attaches it to your trailer is super heavy duty. 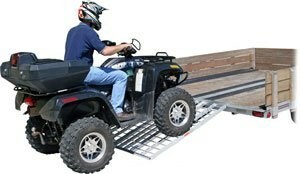 The ramp can be folded down from 481/2 inches wide to just 17 inches wide for easier storage. It's made completely out of aluminum and weighs only 30 pounds.